Tricia Yu’s Tai Chi Fundamentals® Program provides a clear system for mastering Tai Chi basics and a gateway to all traditional Tai Chi. The first program of its kind, it includes resources for professional use including movement analysis, documentation for reimbursement, therapeutic and functional applications. The program is adapted for use with walkers and wheelchairs and modifiable for individual needs. Standardized Movement Pattern (Basic Moves) training sequence that follows a systematic developmental progression with consistent, discrete measurable increments in difficulty to optimize learning and provide a template for assessing and correcting postural imbalances. This training helps participants perform the flowing moves of Tai Chi form properly. Taught in three sections that progress in difficulty. Tai Chi Fundamentals® Form, a modified Yang Style lineage formthat refers to the Movement Pattern training sequence. Mind/Body Principles are integrated into all movement training to foster attention, focus breath and body awareness, and relaxation while moving. Fidelity: The program includes professional CEU-approved seminars, instructional DVDs and books for both instructors and students, patient handout software database, multi level certification options and recertification requirements. Currently there are 90 Certified Instructors In 20 states. 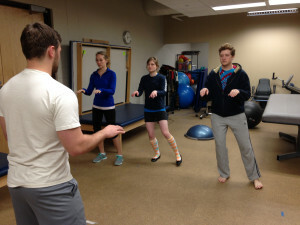 Certified instructors include Tai Chi, fitness instructors, PTs, OTs, nurses, activity and recreation professionals.